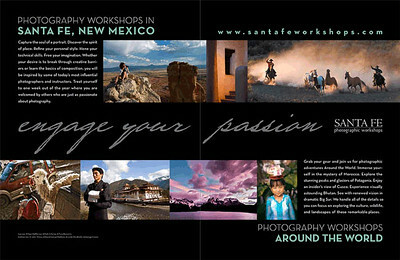 Drove the creative, brand, and content strategy for the Santa Fe Photographic Workshops. 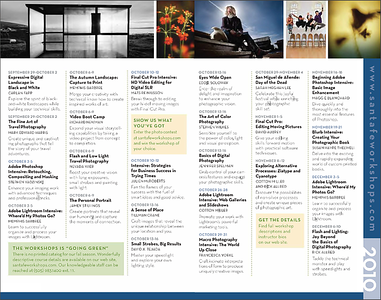 Led the end to end production of bi-annual course catalogs and seasonal brochures. Managed designers, copywriters, instructors, advertisers, internal stakeholders, and printers. Coordinated with internal team and vendors on list management, inventories, press checks, and drop ship needs. 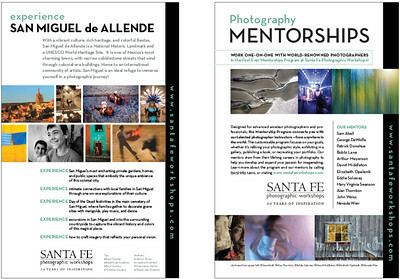 Developed sell sheets for stand-alone programs to promote at trade shows, partner events, and within welcome packets for current workshop attendees. Introduced new revenue stream through the release of a photo contest campaign. 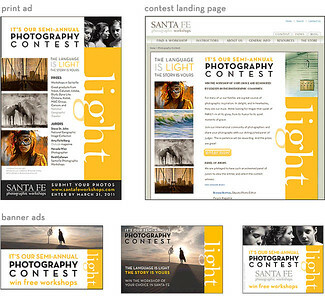 Led implementation and marketing, including identifying a SaaS vendor, site design and integration, legal, branding and collateral, and a multi-channel campaign. Messaging extended across social, enews, partner communications, and was incorporated in direct mail pieces. Overhauled the creative direction of print and online ads by featuring dynamic and experiential imagery to attract amateur photographers. Shifted from heavy reliance on print advertising to digital channels, including social, partner communications, and industry sites. 2018 © Copyright Deb Mindel. All content and images on this site are property of Deb Mindel or respective clients.